Shane Jones has always seemed to be an embarrassment waiting to happen for the Government. He has already ventured into iffy territory for a minister, for example his public attacks on Air New Zealand. Now he has dived into a dispute with Greenpeace over party donations, which involves a prosecution of a subsidiary of Talleys, a company that Jones has financial and social links to (Winston Peters also). NZ First MP Shane Jones has fired a shot across Greenpeace’s bow, accusing the organisation of deliberately tarnishing New Zealand’s international fishing reputation just to fundraise. But Greenpeace’s New Zealand Executive Director Russel Norman fired back, saying Jones was trying to distract the public from the fact he has accepted donations from fishing company Talley’s. Norman said this should preclude him from contributing to fisheries policies. The war of words erupted after a Greenpeace press release implied Jones should be withdrawn from any debate around fisheries because of donations he had received from Talley’s. Financial links between Talleys and NZ First have been known for a long time, as has Winston Peters support for commercial fishing. Norman said it would appear from the outside that Jones was having “quite a big influence on fisheries policies”. Jones said he had received donations from the company but they were in compliance with Parliament’s rules on donations. He said Norman was using “politically lurid language,” which was “all part of their [Greenpeace’s] process to fundraise. Speaking to the Herald, Norman said it would appear from the outside that Jones was having “quite a big influence on fisheries policies”. He said Norman was using “politically lurid language,” which was “all part of their [Greenpeace’s] process to fundraise”. “Greenpeace has a track record of misinformation and exaggeration. “It’s extraordinary that the Greenpeace’s Australian spokesman Russel Norman is ranting in such a way to damage the good name of New Zealand. Greenpeace has a track record of misinformation and exaggeration. One could suggest similar about Jones ranting. Norman said this “obviously was not” his intention and said it was just a distraction from the fact an Amaltal fishing vessel was caught doing bottom trawls in a protected area of the Tasman Sea. Amaltal is a subsidiary of fishing company Talley’s. In a statement, a spokeswoman for the Ministry for Primary Industries (MPI) said MPI had initiated a prosecution against Amaltal, as well as the person who was the master of the vessel at the time of the incident. Both are facing charges under the Fisheries Act, the spokeswoman said. In its own statement, Amaltal confirmed one of its fishing vessels had inadvertently fished in an unauthorised area of the Tasman Sea in May last year. But Jones has defended Amaltal. Jones said this was a “mere technical issue which would be ironed out when common sense prevails”. Regional Development Minister Shane Jones is being accused of breaching parliamentary rules by appearing to support a fishing company that’s facing prosecution for illegal fishing. New Zealand First MP Mr Jones described the Ministry for Primary Industries (MPI)’s case against agribusiness company Talley’s as a “technical issue” – when the Cabinet rules warn ministers against commenting on active cases. But Mr Jones is now facing criticism for getting too close to the Talley’s case, calling it a “mere technical issue which would be ironed out when common sense prevails”. Greenpeace executive director Russel Norman said it’s “completely unacceptable for a Cabinet minister to intervene in an active court case where the Crown is taking Talley’s to court for environmental damage”. The Amaltal Apollo, a vessel owned by a subsidiary of Talley’s, is facing 14 charges for fishing in protected waters in the Tasman Sea. “I think there’s no question that Jones has breached the Cabinet Manual, which is the rules that govern the behaviour of Ministers,” Mr Norman said. It does look like quite questionable comment on a current investigation by Jones. Talley’s donated $10,000 to Mr Jones’ 2017 campaign. And while Mr Jones accepts that, and that he’s mates with Talley’s boss, Sir Peter Talley, he says it doesn’t mean anything. Instead, he’s blaming Greenpeace for spreading what he calls “misinformation”. There seems to be some fairly solid information here that suggests that Jones is again an embarrassment to the Government. Mr Jones has previously been chair of Sealords and held top positions within Māori and Pacific fishery organisations. He makes no secret of his continued close relationships with the big commercial fishing companies. It’ll be up to the Prime Minister to decide whether Mr Jones has overstepped the mark and breached the rules in this case. Due to Labour’s reliance on NZ First for support will Jacinda Ardern do anything about it? Probably not in public at least, or nothing more than a slap over the wrist with a wet bait fish. Paul Goldsmith, National’s Spokesperson for Economic and Regional Development, has been nagging away at Shane Jones, the minister in charge of the Provincial Development Fund. Hon Paul Goldsmith: When he told the National Business Review that we have to make sure that “We’ve got enough nephs or if necessary a few Melanesians to help plant the trees.”, what proportion of any new forestry jobs does he expect to be filled by Melanesians, presumably by the way of the Recognised Seasonal Employer (RSE) scheme? Hon SHANE JONES: Yes, well, from Melanesia we already draw a host of RSE workers and policy is being looked at, but the preference is to get the proverbial nephs off the couch. It is proving to be a challenge as a consequence of the last nine years of Kaikohe, Kaitāia, Gisborne, Hastings, and a whole host of other places—and I would remind the member that $50 million was put aside by his Government and not a single neph got off any couch, because they never spent any of that money. Hon Paul Goldsmith: I raise a point of order, Mr Speaker. The question was what proportion and he made no reference to anything like that. SPEAKER: Right, I think the Minister can have another go. Hon SHANE JONES: In terms of proportions between workers that may or may not come from Melanesia and the nephs, such a policy is under active consideration. Rt Hon Winston Peters: Can the Minister confirm that the fame of this visionary policy has been so far-reaching that countries in the Pacific and Pacific Islands are now mustering their workforce to assist the member in the implementation of his plan? Hon Gerry Brownlee: Come off it. What a load of rubbish. National’s Paul Goldsmith said the slip was of concern as he controlled the $3b provincial growth fund. Shane Jones could hire the Prime Minister to work on his tree-planting schemes – and she’d get a pay rise – based on the fuzzy economics of the Provincial Growth Fund. The Government’s travelling caravan of grants and soft loans is continuing to the West Coast tomorrow with the bequeathing of $140 million of taxpayer funds that raises more questions than answers. Last night Goldsmith and Jones were put up for a debate on Q+A last night – Is the Govt’s billion dollar provincial fund the best way to boost regional economies? Jones is responsible for dishing out $3 billion over the current term, so it is important he is held to account. Goldsmith’s nagging is a good way to do this – he doesn’t seek attention as much as some politicians, but his nagging keeps forcing Jones to explain what he is up to. So far at least there is not much detail on the NZ First website about the convention they are having this weekend, apart from notices about it. On behalf of the Board of Directors I would like to invite you all to the 2018 Convention & AGM to be held at the Tauranga Racecourse on the 29th and 30th of September. The Convention and AGM is New Zealand First’s largest gathering and networking event of the year. It will be a pleasure to see you all again as we mark an important milestone in our Party’s history – 25 years. The Convention weekend will be fun filled and energetic as make the big decisions that will define our party for the next 25 years. Since the last election New Zealand First has had a significant role in shaping the Government of our country and I am proud of the work the Rt Hon Winston Peters, our Ministers and our MPs have been doing. Make the decision to join the other movers and shakers in our Party and if you have any issues please get in touch with our Convention organising team. betterment of our people and our country. We could not have embarked on this mission without your support and contributions. celebrate our 25-year anniversary and look toward the future. Party conventions serve many purposes. The base of diehard supporters – who you need to enthuse so they can volunteer at the next election – have to be kept happy. But there are also a lot of TV cameras and mischievous journalists there – so the party must project itself as sensible, coherent, and able to win over any voters who have faded away since the election. And while polling of NZ First between elections is notoriously bad, the party does need to win some votes back. Most of the recent public polls put it below the all-important five per cent threshold, and it seems most of the internal polling has it below there too, with the Greens still above the line. You can’t be the kingmaker if you are outside of Parliament, as Peters knows well from his stint in the wilderness after 2008. Behind all the blustering there is one large question that faces NZ First: who does the party turn to when Peters finally retires? It could happen in a few years, it could happen in ten, but the MPs behind him have been maneuvering like it could happen tomorrow. Shane Jones has his billion dollar fund and high media profile, putting him solidly in the lead. But don’t count out the very charismatic Fletcher Tabuteau, who won the deputy leadership and will deliver a caucus report speech on Sunday morning, ahead of Peter’s speech in the afternoon. Sometimes a little bit of anonymity goes a long way. NZ First members have voted for several remits aimed at the banking sector, including a $50m levy to keep banks open in small towns. The remit seeks to levy $50m from the banking sector that was redistributed to banks as a subsidy to keep banks in small towns open and for longer hours. Other remits aimed at promoting the Government’s use of New Zealand-owned banks, buying back shares of KiwiBank from the Super Fund and ACC were also passed with no opposition. However, accepted policy remits from the conference have a long road to becoming actual Government policy, including the caucus policy committee of NZ First and Cabinet itself. Boxer Joseph Parker was the surprise speaker at New Zealand First’s annual convention in Tauranga today. What probably made it more surprising is that he is the nephew of National MP Judith Collins. There will be more from the NZ First convention today, but I may not have time to post on it. ‘Infrastructure entity’ is an odd description for a new layer of bureaucracy. 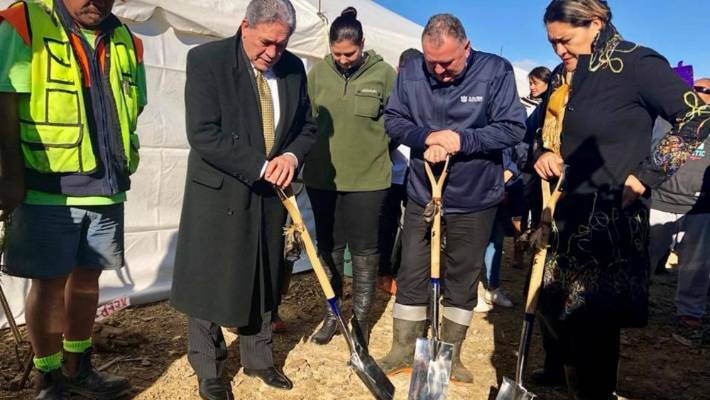 A new independent entity will be established so New Zealand gets the quality infrastructure investment it needs to improve long-term economic performance and social wellbeing, Infrastructure Minister Shane Jones has announced today. Speaking at the annual Building Nations Symposium in Auckland, Shane Jones said the new entity would provide greater certainty to the industry and better advice to Ministers to ensure adequate, long-term planning and investment happens. “When we first came into Government, it quickly became clear that we’re facing a major infrastructure deficit with no plan to tackle it. We’ve struggled to get a clear picture from officials of its scale, when it would hit us the worst and in which sectors. “Treasury is currently unable to properly quantify the value of the deficit we’re facing – it doesn’t hold accurate or up-to-date information about all infrastructure projects across all sectors and advises that agencies themselves may not necessarily know the extent of their future capital needs. “This is just not good enough. This Government has a firm eye on the future and not just the next few years. We’re determined to improve economic performance, and social and environmental wellbeing for generations to come and getting on top of our infrastructure challenge is key. “That means ensuring New Zealand can make the timely and quality investments in vital infrastructure, such as hospitals, schools, transport networks, water and electricity. And it means being open to innovative solutions to sourcing the capital we need. “We’ve listened to industry and local government – they need greater visibility of our infrastructure needs. “This new entity will provide that certainty so we can make the right investments, in the right places and the right time. “We’re already making a significant dent in our infrastructure deficit. Net capital spending in the next five years will be more than double that of the previous five years with the Government investing about $42 billion through to 2022. “This is a good start, but we need to do better over the long term and I’m confident the new infrastructure entity will help us really sharpen our planning for the future. “Treasury will now lead the development of the detailed policy working alongside key industries and I’ll report back to Cabinet early next year with options on how to structure the new organisation,” Shane Jones said. It is anticipated the new infrastructure entity will be operational by late 2019. That was quite a different Shane Jones to what we usually see in Parliament. He didn’t stray into flowery crap. It was a fairly forthright performance, saying what he wanted to do, saying what he couldn’t do because of limits imposed by government agreements (especially in the spending cap), he criticised past governments including his then Labour government under Helen Clark, and also (t an extent) praised National initiatives and cooperation. Apparently the ‘infrastructure entity’ was a National policy that Jones has taken on.